When most people think about cooling their homes, the first thing that comes to mind if air conditioning. There’s no doubt that here in “Hot-lanta” air conditioning is crucial, but it’s not your home’s first line of defense. Just like keeping rain, wind, and cold out of your home, your roof is your greatest defense against the elements. That includes heat. The right roof can keep heat out of your home. And that’s a benefit for the environment and your pocketbook. A “cool roof” can reduce your energy bills by hundreds of dollars a year. So if you are thinking of replacing your roof, or just looking for a way to keep your home cool, read on to find the best roof for hot weather. 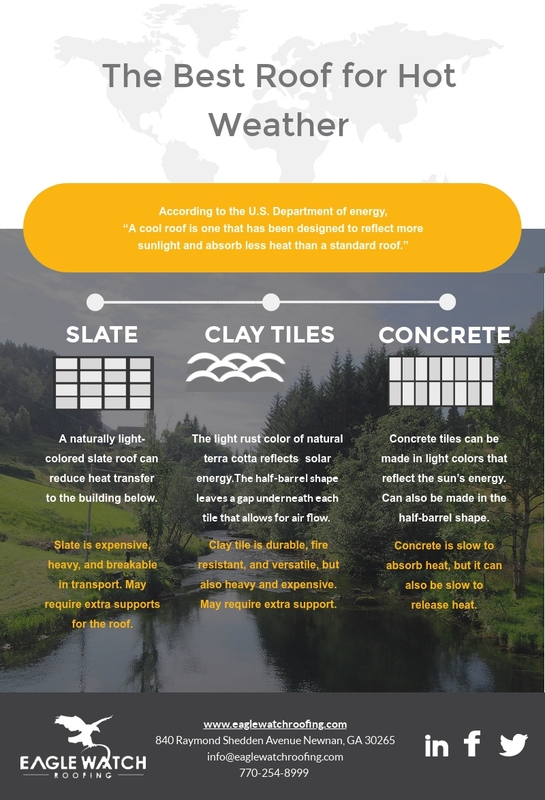 According to the U.S. Department of energy, “A cool roof is one that has been designed to reflect more sunlight and absorb less heat than a standard roof.” A cool roof works just like wearing light colored clothes on a hot summer day. The light colors reflect sunlight and keep you cooler. Another common example is the color of your car, but interior and exterior. When you leave your car out on a hot, sunny day, inside temperatures can soar. But if you have dark-colored seats, you may find that the seats have absorbed so much heat that you can hardly sit on them. Light-colored seats reflect sunlight and stay much cooler. A dark colored roof can soar to a stifling 150 degrees on a hot day. A cool roof can stay up to 50 degrees cooler. Cool roofs can be made of a variety of light-colored and reflective surfaces. Some asphalt shingles are coated with special granules that reflect solar energy. Many types of tile roofs are naturally less prone to absorb heat. They can also be treated to make them even more heat resistant. Roofs made of slate roofs in light colors are also highly heat resistant. Metal may not seem like an obvious choice since we all know that metal can get very hot to the touch on a sunny day. But many metal roofs are naturally reflective. Coatings can make them even more heat reflective, keeping the home beneath much cooler. Green roofs are a unique type of cool roof. Green or living roofs are roofs that are covered with plants or even a garden. They are more common in urban settings and on flat roofs than typical single-family homes. They can provide excellent insulation, control runoff, and offer beautiful green spaces for urban residents. Slate has been used for centuries in Europe. In the United States, it has been in use since the 17th century, beginning with some of the earliest European settlements. Slate is extremely durable and requires minimal maintenance. A slate roof can last fifty years or longer and is mostly impervious to algae and rot. It is also highly fire resistant. A naturally light-colored slate roof can reduce heat transfer to the building below. The light color reflects solar energy and stays cooler than a darker roof. The main drawback of slate roofs is the cost. Slate is an expensive material. Its weight and breakability also make it more expensive because it is harder to ship and transport. The added weight also means that not all structures can support a slate roof. In some cases, a building may need retrofitting and added supports to hold a slate roof. Terracotta tiles have been in use for centuries in the hot, sunny regions around the Mediterranean. In Spain and Italy, terracotta was so widely used that it has become synonymous with the local architectural styles. Some ancient terracotta roofs have been withstanding the hot summer sun for centuries and are still in excellent condition. Terracotta traveled to the New World with Spanish settlers and has become a favorite roofing material in Mexico and the American Southwest. In these hot, dry climates its cooling abilities are a major benefit. The light rust color of natural terracotta reflects a significant amount of solar energy and much more than a darker roof. Modern clay tiles may be coated or painted to look like slate or traditional terracotta. Additional coatings can make modern clay roofs both heat and water resistant. The shape of traditional terracotta tiles also makes them cooler. The half-barrel or “s” shape of interlocking tiles leaves a gap underneath each tile that allows for air flow. The air flow prevents the roof from storing as much heat and keeps the tiles cool. Clay tiles can be more expensive than other forms of roofing, but their longevity may make them more cost-effective in the long run. It is common to see clay tiles on houses built of concrete, and that is for a good reason. Like slate, clay tiles can be heavy and require a well-supported roofing structure. Concrete tiles are more expensive than traditional asphalt shingles but less expensive than slate and clay tiles. They can be made to mimic almost any other type of roofing. Concrete tiles are incredibly durable, impervious to rot and algae, and highly fire resistant. Like slate and clay tiles, they are heavy and may require extra support. Concrete works very well for hot climates. It can be made in light colors that reflect much of the sun’s energy. They can also be made in the half-barrel “s” shape typical of terracotta tiles. That shape allows for extra airflow, further cooling the roof. Concrete is slow to absorb heat, but it can also be slow to release heat. Metal roofs can be an excellent way to reflect much of the sun’s heat and energy without the extra cost and weight of slate and tile. A metal roof is more expensive than traditional asphalt, but it is less costly than slate and most tile. When painted white, a metal roof can reflect about 66% of the sun’s energy. While this is slightly less than white tile, it is still enough to make a significant difference in the temperature of the home. That translates into substantial savings on energy bills. One primary advantage metal roofs have over other cool roof materials is how quickly it releases heat. While tile roofs, and especially concrete, can hold heat for a long time, metal roofs cool relatively quickly once the sun goes down. When correctly installed, a metal roof can last for three times as long as a traditional asphalt roof. This durability means that in the long run, a metal roof may ultimately be cheaper than asphalt. If you are considering upgrading to a cool roof, Eagle Watch Roofing has got you covered. We offer a variety of roofing options in all different materials. We can take a look at your roof and your home and help determine the best choice for your home. Our roofers are experienced experts who will get your job done right. So if it’s time to replace your roof, or if you just want an upgrade, contact us today to get started! ← How Much Does A Metal Roof Cost?